I was going to put together my system details but I keep coming back to how all that stuff fits and works in my room and since I pretty-much view the room as an important - maybe the most important - part of my system, I'll start by detailing it. My listening room is a 12.5' x 23' x 7.5' below-grade, dedicated room that started with some good basic ingredients and didn't require too many family compromises, so I built it out with some fairly extensive room treatments. It's absolutely 'old-school' textbook, passive, analog, dinosaur technology, built with a little science, planning, and DIY elbow-grease quite some time ago - pretty much before digital room correction for the masses existed. I fully understand that I may be missing out on the possibility of going further by converting everything to PCM digital, applying DRC in a little computer then converting back to analog with a DAC in-that-box, but I'm just fine with staying in a (mostly) analog world, and this room lets me do that. It works very well to my ear now when I play a record (through an all tube system to a passive crossover and old alnico drivers) and it works just as good when I play digital down the same path from the pre-amp inputs. Analog is my gold standard and with this approach I enjoy vinyl to a pretty high level, and as digital catches up, well, the room is already there. When we went looking for a house several years ago, I tried to get something with a room having a favorable W x L x H ratio and solid construction to support decent bass and isolation from the rest of the house - and maybe got a little lucky. It's in the basement (where the family is OK with it being dedicated to audio), 12.5' x 2' and has a 'visual' 7.5' ceiling -visual because there is a lot going on behind that black cloth that extends that height in places. The floor is laminated wood on poured concrete with drywall over concrete block on the 4 side walls and it's proven to support very solid bass. There is 1 door, 2 short windows high on a side wall and a small bulkhead, so not much to get in the way of tuning to a simple rectangular model, which I think made planning easier and the results more predictable. I started by burying myself in Everest's Acoustics texts (fantastic books for this! ), then playing with the numbers in a spreadsheet where I tried different materials and combinations of diffraction and absorption techniques to get to a reasonably balanced reverb time (copy of spreadsheet below). I tried not to overdo absorption in the mid to high frequencies (it's very easy to go overboard there as most acoustic treatments only work there) and concentrated absorption in the first reflection points. 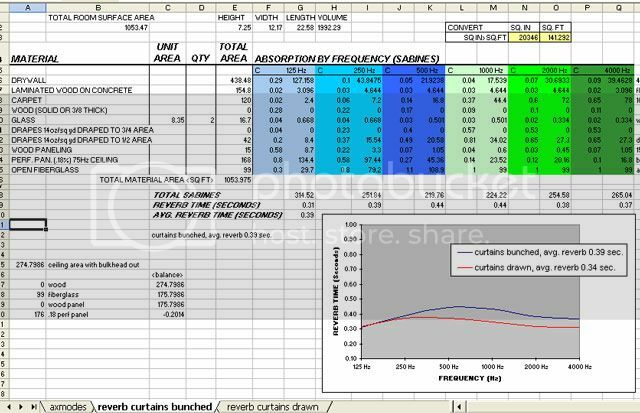 Doing all this planning in Excel was extremely helpful as I could just adjust the areas of various treatments or construction materials and see the theoretical effect on reverb time, balance, etc. I think going through this phase in software saved me a lot of time adjusting and changing things after the fact and the results seemed to nicely match the sims - at least to my ear. I have not measured anything in there yet, can get past just listening. The ceiling treatment is notable in that it uses some tuned bass trap sections and some open areas to expose the floor-joists above for some strategically placed diffraction ("scatter" according to tomlinmgt ) and absorption. This was all done using black grill-cloth covered plywood panels so it looks like a flat ceiling, but has bass-absorbing perf-panels in the corners (tuned to the problem frequencies) and the open areas (diffraction and absorption) over the listening position at the first reflection points. 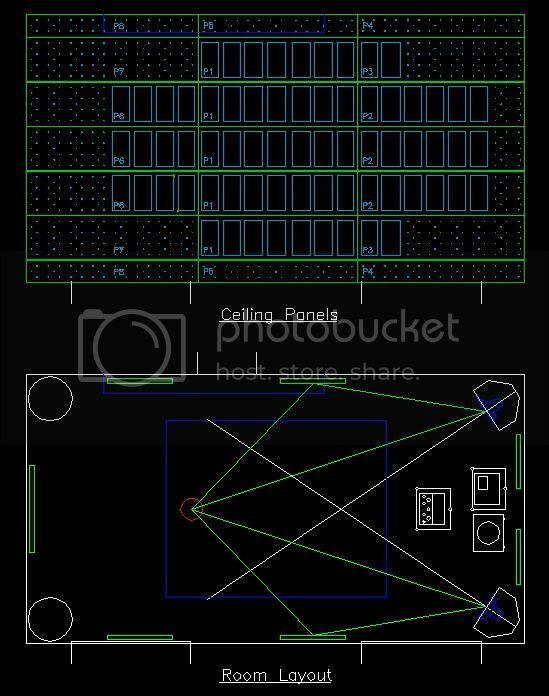 The drawing below shows how I distributed these mixed ceiling panels and how I worked it into my initial equipment layout. The rear wall (behind the listening chairs) is mostly taken up with an Expidit rack for storage of records, CDs, equipment, etc. which is pretty randomly loaded so provides a decent level of dispersion. I also have 2 of the wall panels at 45 degree angles back there in the corners. My original plan was to use curtains for absorption to add a level of adjustability to the space but I fell into some free office partition panels (heavy MDF panels covered with mineral wool) which work very well as substitutes. These combined with a carpet and the open absorption area of the ceiling, cover all the first-reflection points, but I use more of them in there and move, add, remove these panels to 'tune' the room. If I remove a few, reverb goes up and the space becomes more lively, adding some makes things a little darker, intimate and smokey-good like a small club. It's pretty immediate and cool to play with this but in the end I've found a sweet spot that suits most of my listening (leaning towards intimate) and I pretty much stick to that configuration. Also worth noting is that when I had the ceiling torn down, I put in 2 dedicated circuits back the breaker panel for audio using 12ga romex with hospital grade outlets. I also keep all the digital on its own circuit - not sure if this has much of an effect on things but since I can, I do, and the more I isolate noisy switching-mode digital PSs from all the analog, the better things sound to my ear. I currently stream digital over copper so have a few 1G Ethernet connections into the room from my switch & file server in another room. Some recent additions to my system have really enhanced what this room is capable of - like 'helper' woofers behind a big SS amp and some digital EQ - but this space was put together to let my simple SET>high-efficiency speaker system perform at it's best and I think it's pretty effective at that. In this house, I'm pretty much done on the room front. Nice write up Bill. Noticed on your room diagram you have the speakers back to the corner, with a toe-in. but the pictures look like you brought them out and have them straight ahead. I got about the same placement on my 620's, but have a toe-in so I'm looking down the throats of the horns. I don't know if its a psycho-visual-acoustic thing, but I ended up doing the same thing with all my horns. Could you share your thoughts on your placement. Speaker placement really changed when I added a pair of Altec 416A helper woofers in the corners (ratty old aristrocrat cabinets for now). This completely changed what I was after from the mains as it was no longer about bass-extension and squeezing the most out of my little flea-watt amps. With the bass well taken care of by 416s (which nicely load the room and match the 604 on the big-tone front) I found the 604s sounded more open out in the room and had better depth and image accuracy. It was also nice to leverage the reduced ballsy bass power requirements on the 2A3 amp, and I started messing with 45 SETs again and 2A3s that excelled in the mids and highs (like the RCAs I now use) instead of some of the newer 2A3s that do better bass. I haven't messed with toe-in much as the image really seems to snap-in where they are now (a little toe-in) but there was a bit of a trade-off in width (less toe-on) and razor-sharp focus (looking down the horn throats). This get's even more complicated if you start messing with the obsorption panels on the side walls and this really IS a narrow room for these so it's been a matter of choosing my compromises, and in this room, a little less toe-in seems best. I've always admired the effort you put into designing your room, it's amazing. Do you have side wall absorbers as well as the ceiling? how many sq ft did you use? Always loved your room......Great write up and explanation. Beautiful write-up of a beautiful room. Thanks everyone! Building out rooms that focus on audio performance (I've done it to varying degrees before) have been by far the most important things I've done towards improving my systems and aside from the house ( ), the most cost-effective. Thanks Kyle - you have to get over sometime for a listen. On the side walls I use those office partition panels I mentioned, which you can see in the photo of the room above on the front wall (have to update that, not a great view of things). The panels are very heavy MDF covered on both sides with rockwool and trimmed out in grey cloth and oak so look reasonably decent. I just lean them against the wall so there is an increasing air gap behind them; from nothing at the top to about 5" at the bottom. They are about 5' high and I have widths of 2-6", 3-6" and 4'. With the balance I've settled on I use 2 of the 2-6" panels on the front wall, 2 of the 3-6" at the first reflection points and 2 in the rear corners next to the expidit rack (angled at 45 degrees, in the positions taken up by cylinders in the above drawing). 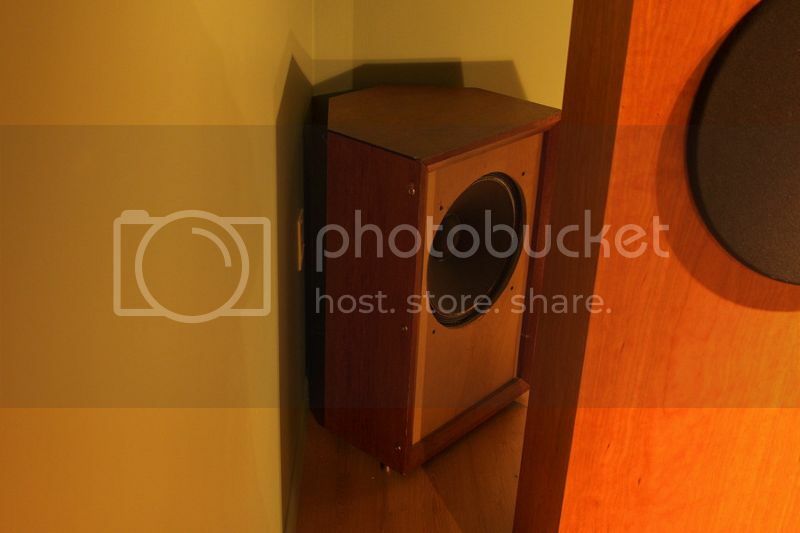 The side wall location was first located using a mirror but it's moved a bit over the years, as has the listening position, especially after adding the 416 woofers. The cool thing about having a few of these panels to choose from and avoiding permanent mounting is the flexibility - I choose and move them to suit things as small as system changes or the type of music I'm leaning towards over time. In the end though, I have found a personal sweet-spot and pretty much stick to it and as mentioned, it's leaning towards a slightly soft, intimate space which nicely suits the Jazz, Blues, Folk & Americana I listen to a lot lately. Still lights up with huge dynamics and drive (4 15" Altec drivers in the room ) when called for though, so my rock seems well served as well. I don't think there are many folks out there who have taken such painstaking measures to "engineer" their room as you have Bill. That must have been a lot of time and effort to get it to the point it is now. Awesome job! Do you happen to have any photos of the ceiling treatments before covering it? Thanks Anthony. I never took any pictures of it under the covers back when I built it. The ceiling was spread out over a pretty long time and I did it one 2' x 8' panel at a time where I'd lay out the pattern using CAD, drill or jig-saw the wood, give it a quick coat of black paint then stretch fit and glue the grill-cloth onto it. I'd then put thin strips of foam sill-plate insulation on the wood joists above, air-nail the panel into place with brads and cover the seams with black painted trim strips. Took a while but worked out great from a sonic perspective and has even proven to be sort of future proof - it wasn't too big a deal to tear part of it down temporarily a little while back when I wanted to add some network cable runs for the living room above. Brilliant Bill, bloody brilliant!!! I can tell all who have not had the pleasure of hearing Bill's set up that it sounds bloody brilliant as well!!!! All of this time and effort have paid off to reflect perhaps THE best system I have ever heard, bravo mate!!!! I like it. If I had a dedicated listening room there would be problem's around here. Very nice Bill, you have a wonderful room. How did you decide where the first reflection points were? Is it a certain angle from the center of the speaker? When I was in the design stage, I determined first reflection points using math calculations, which was pretty easy using CAD once I drew up the room. I assumed things like wall treatments and the floor (carpet) would be pretty easy to change so didn't sweat them much but for the ceiling I modelled different speaker locations and seating positions to make sure I covered them all with the cut-out panel sections. Basically, just drew incident/reflected lines from the speaker tweeter center to approximate head locations. The easy way just use a mirror and move it till you see the tweeter, trying a few locations to get coverage as wide as you'd like. This works great and we just used this in a friend's room to find the optimum position for his treatment panels and IMO, they sounded best where the mirror said they should go. Of course that assumes you can live with those locations (which I don't think he could) which is why it was nice to start with a fairly â€˜clean' rectangular room in my case, and not worry too much about ascetics and regular space use requirements. It's all about trade-offs and I was lucky enough to be able to minimize them. That is a great idea. I will have to try that, however I'm guessing I may have similar problems as your friend. It would be very exciting starting with a blank canvas. I had someone ask me questions about my listening room and how I treated it, so searched out this old thread and noticed that some of the images and text were messed up. I think forum upgrades or more likely - the platform change the site has gone through - broke some things, so I cleaned it up so it all makes sense again - at least to me it makes sense.